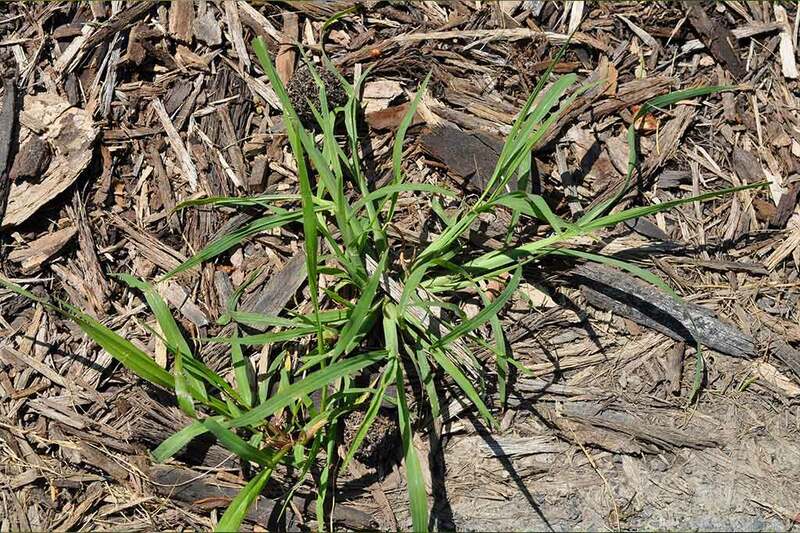 If you can’t identify lawn weeds, you don’t know when or how to control them. 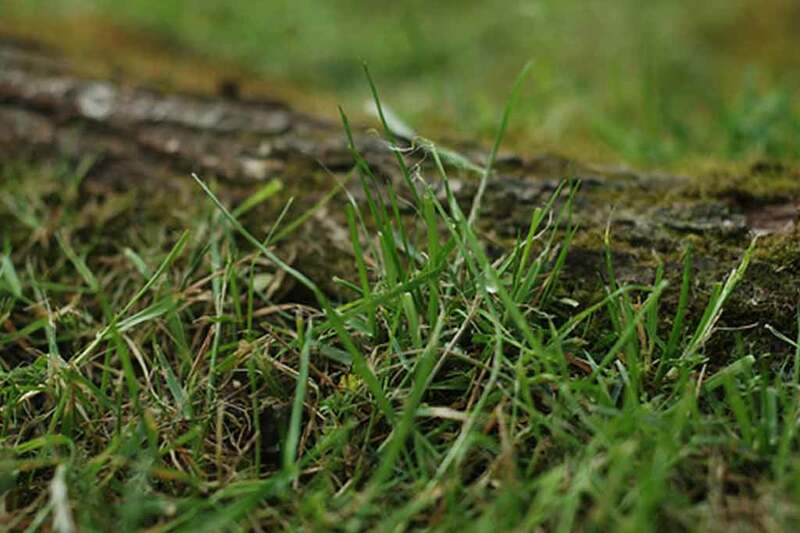 It is difficult to identify lawn weeds without pictures, which is why we are here to help. Yellow nutsedge is a perennial weed in the sedge family and superficially resembles grass. Nutsedges are among the most noxious weeds of agriculture in temperate to tropical zones worldwide. They are difficult to control, often form dense colonies, and can greatly reduce crop yields. In California, nutsedges are particularly problematic in summer-irrigated annual and perennial crops, but yellow nutsedge is much more widespread than a related species, purple nutsedge,Cyperus rotundus. Yellow nutsedge grows throughout California to an altitude of roughly 3300 feet (1000 m). It resembles another sedge, green kyllinga, Kyllinga brevifolia. 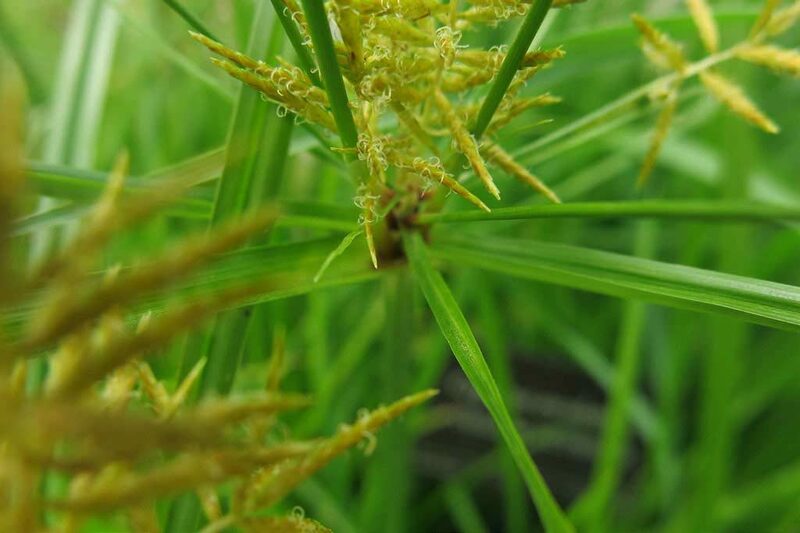 Yellow nutsedge is cultivated in some countries for its almond-flavored tubers, which are used to make a drink. Filaree plants are low-growing, cool season annuals. They can either grow erect or have spreading prostrate stems 3 to 12 inches (7.5 – 30 cm) long. In the early stages, leaves form a rosette close to the ground. The three species of filaree can be distinguished from each other by their leaf shape. Leaves of whitestem filaree are toothed, leaves of redstem filaree are deeply cleft or dissected, and leaves of broadleaf filaree are lobed. Flowers resemble those of geranium and are rose purple. The fruit is long and needlelike. At maturity the fruit separates into five parts, each having a tail that coils spirally as the seed matures and dries. 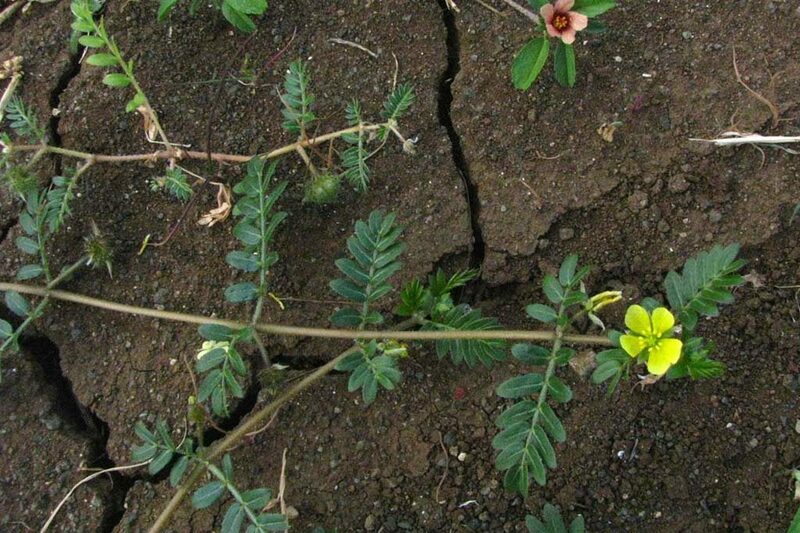 Puncturevine is a warm season, mat-forming annual weed with an extensive root system. Leaves are finely divided into 4 to 8 pairs of leaflets, and stems and leaves are covered with hairs. 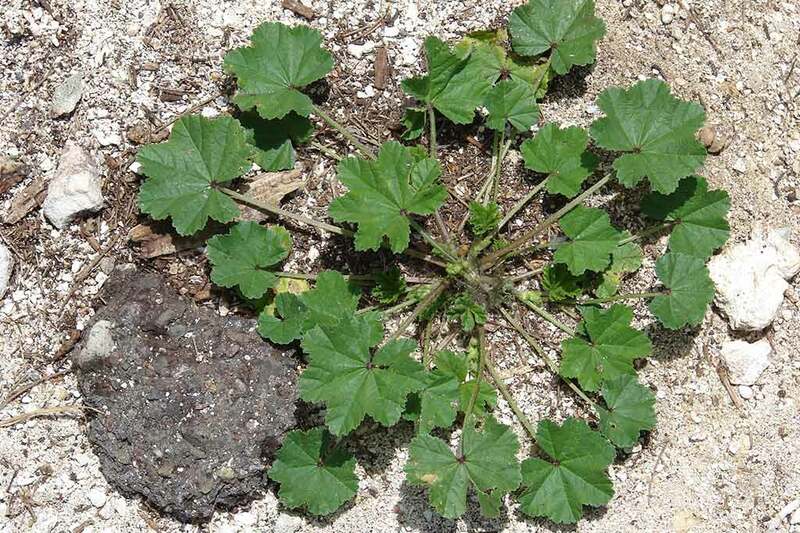 The mature plant grows prostrate on open ground but almost erect in dense vegetation. The yellow flowers are borne singly in the leaf axils and open only on sunny mornings, except in shady areas. The fruit consists of a cluster of 5 spiny nutlets or burrs; it breaks apart at maturity. The seedling has thick, elongate and brittle seed leaves, which are green above, grayish underneath and creased along the prominent midvein. The true leaves consist of 8 to 16 leaflets. 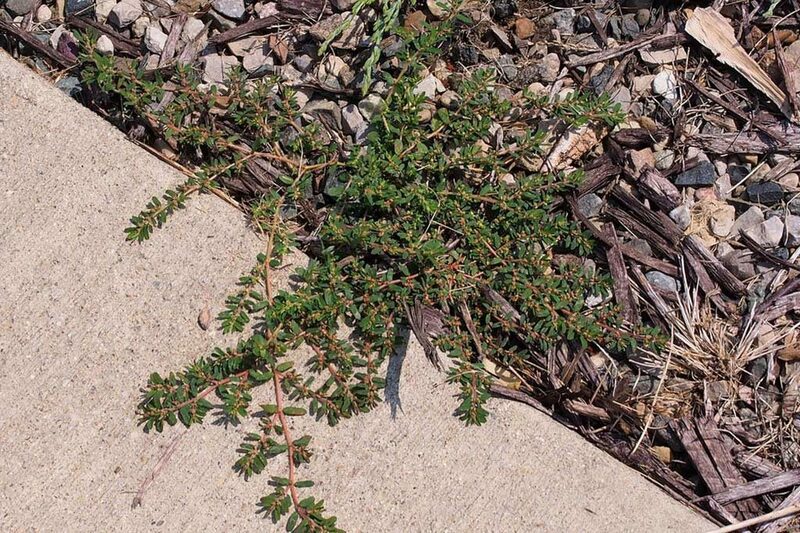 Spotted spurge is a low-growing summer annual plant that often forms a dense mat. The oval seed leaves are bluish green, powdery, or mealy on the upper surface and have a reddish tinge underneath. Leaves on mature plants grow oppositely on short stalks. Unlike creeping spurge, C. serpens,the leaves are marked with a characteristic dark, reddish spot found midway down the center of the leaf vein. When broken, a milky, sticky sap oozes from the stem. Flowers are small, pink, and inconspicuous. They are formed in small clusters between the stem and the upper leaves. Mouseear chickweed is a prostrate perennial broadleaf weed with stems that root at the nodes to form dense patches. Seed leaves are rounded and lack hairs. True leaves are opposite, rounded on the ends, and are sessile (attached to the stem without a stalk). Hairs are prominent on the upper leaf surface and on stems. Small, white, inconspicuous flowers are formed in clusters at the end of stems and have five petals. Each petal is so deeply divided that flowers often appear to have ten petals rather than five. Dandelion is a widely distributed perennial weed. The mature plant arises from a strong, deep taproot that exudes a milky substance when cut. There is no visible stem. Leaves are sparsely hairy or without hairs, have deeply serrated margins, and are clustered in a rosette at the base of the plant. 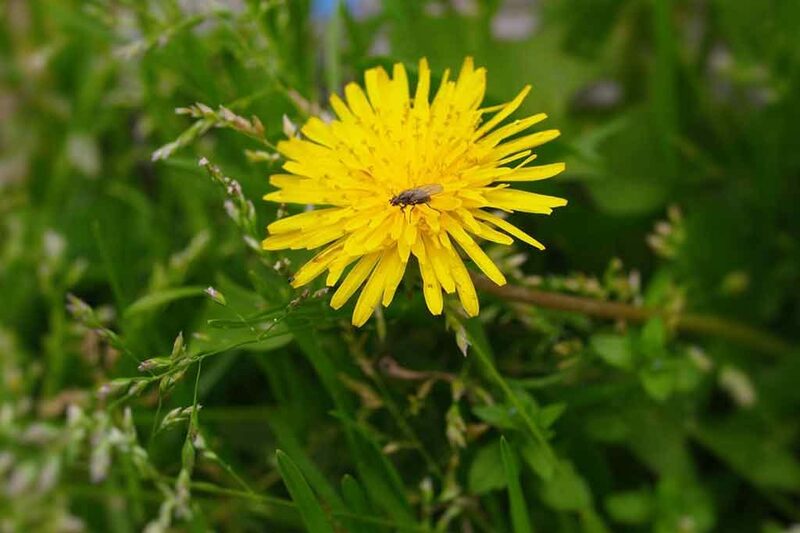 Dandelion can reproduce from seed almost year-round or it can regrow from its taproot. Bright yellow flower heads, 1 to 2 inches (2.5 – 5 cm) across, consist of petal-like ray flowers and are borne singly on the tip of a hollow stalk, 3 to 12 inches (7.5 – 30 cm) long. Seeds are enclosed singly within fruiting bodies and are attached to a long slender stalk that terminates in a parachute-like structure called a pappus. Seeds are transported in the wind. The bristles on the seeds can clog cultivation equipment. 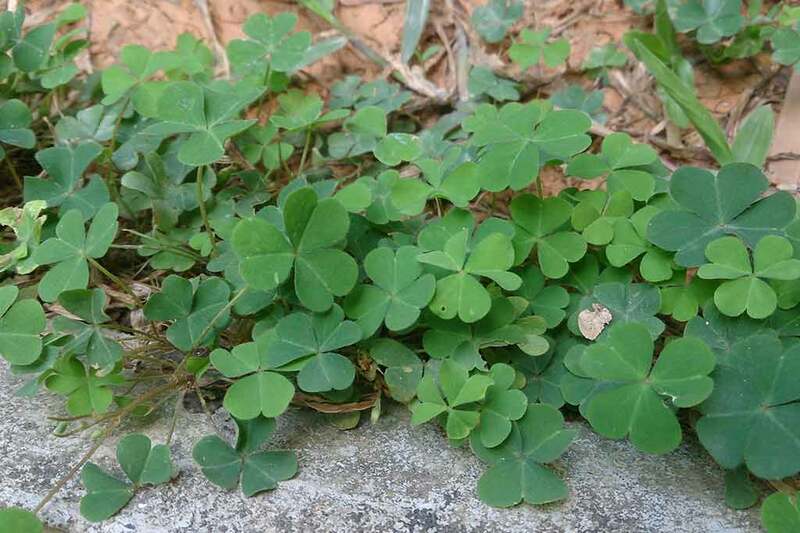 Creeping woodsorrel is a perennial that has alternate, compound leaves, each consisting of three heart-shaped leaflets resembling clover. Attractive yellow flowers, borne singly or in small groups, are very characteristic. The mature plant has creeping stems emerging from a slender taproot. The stems root at the nodes and invade larger areas. When seeds mature, pods open explosively, often spreading seeds 10 feet (300 cm) or more. Oxalis prefers shady situations. Creeping woodsorrel resembles buttercup oxalis, but the flowers are not as large and showy and the growth is less upright. 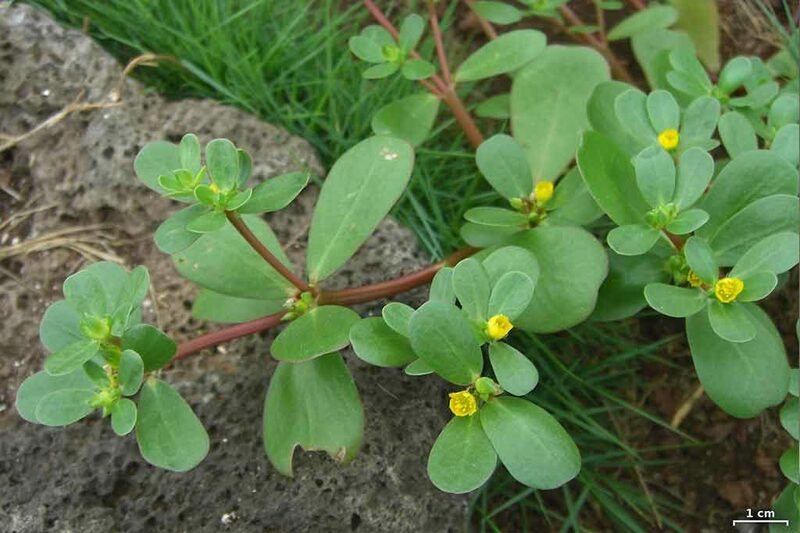 Common purslane is an annual that grows rapidly in spring and summer. It thrives under dry conditions but also competes well in irrigated situations. Plants prefer loose, nutrient-rich, sandy soil. The mature plant may form a mat or grow up to a foot tall. The plant branches at the base and along the stems. Leaves are very succulent, often tinged red, and wedge-shaped. They are opposite or alternate along the stem and are without petioles. Small yellow flowers are born singly or in clusters of two or three in stem axils or at tips of stems. Flowers usually open only on sunny mornings. Purslane seeds are very tiny and produced in abundance. 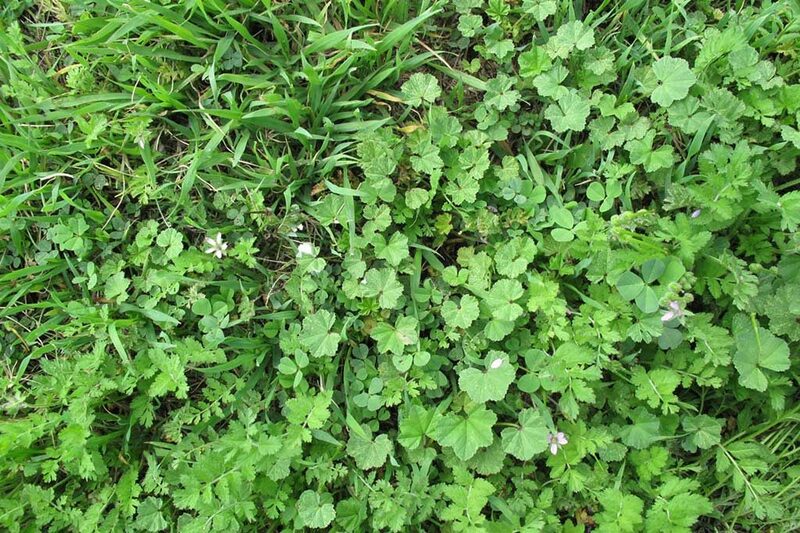 Little mallow (cheeseweed) is a winter annual. Seed leaves are distinctly heart shaped and tinged red. True leaves are roundish with wavy, shallow-toothed margins and a red spot at the leaf base. The mature plant forms dense bushes that trail along the ground or grow upright, 1 to 4 feet (30 – 120 cm) tall. It has a tough, woody stem. Its flowers are white with a bluish or pinkish tinge and are held in clusters in the leaf axils. The fruit resembles a miniature wheel of cheese. Common groundsel is an early season weed in most areas, but can grow all year in coastal areas of California. Seed leaves of groundsel are elongate, with a blunt, rounded tip. The first true leaves have shallow teeth; the third and fourth leaves are more deeply lobed. 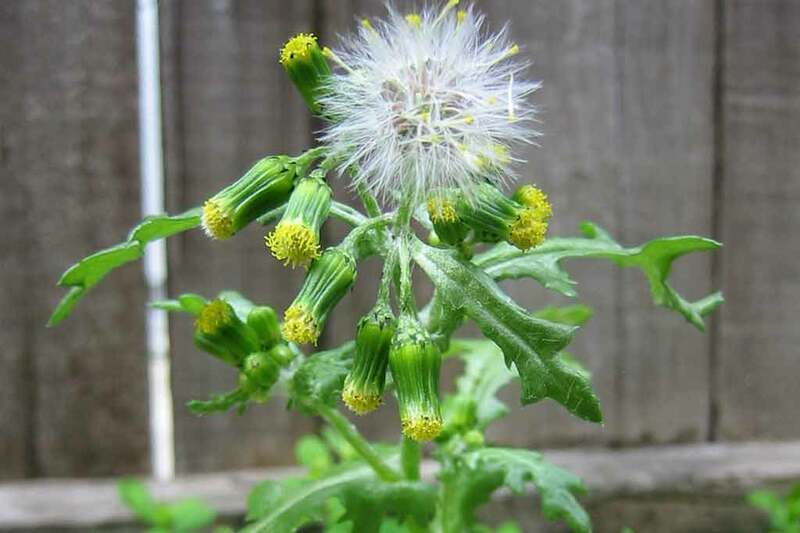 Groundsel grows up to 60 cm (2 feet) tall. Leaves are alternate on the stem and deeply indented. Upper leaves are attached directly to the stem, but lower leaves have a short petiole. The green bracts surrounding the flower cluster have conspicuous black tips that distinguish groundsel from other weeds in the thistle family. Annual bluegrass is a low-growing, cool-season grass which dies early in the summer when the top layer of soil dries out. It can easily be distinguished from other grasses by its typical leaf tip which is shaped like the bow of a boat. The leaf blade is often crinkled at the midsection. Annual bluegrass has a membranous ligule that is rounded with a slightly pointed tip. The mature plant grows as dense, low-spreading tufts, 3 to 12 inches (8 – 30 cm) tall, and often roots at the lower nodes. Bermudagrass is a low-growing, wiry perennial that has two types of shoots: those aboveground (stolons) and those belowground (rhizomes). 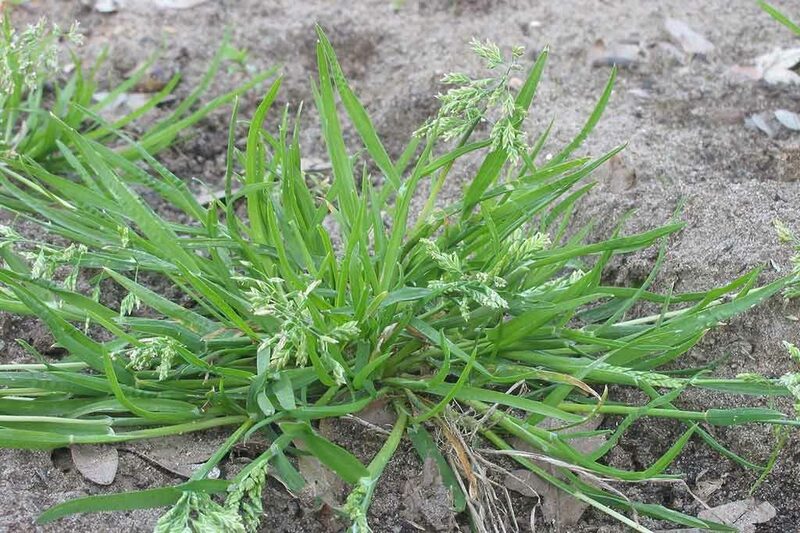 The flowering stem is similar to that of crabgrass (Digitaria spp.). 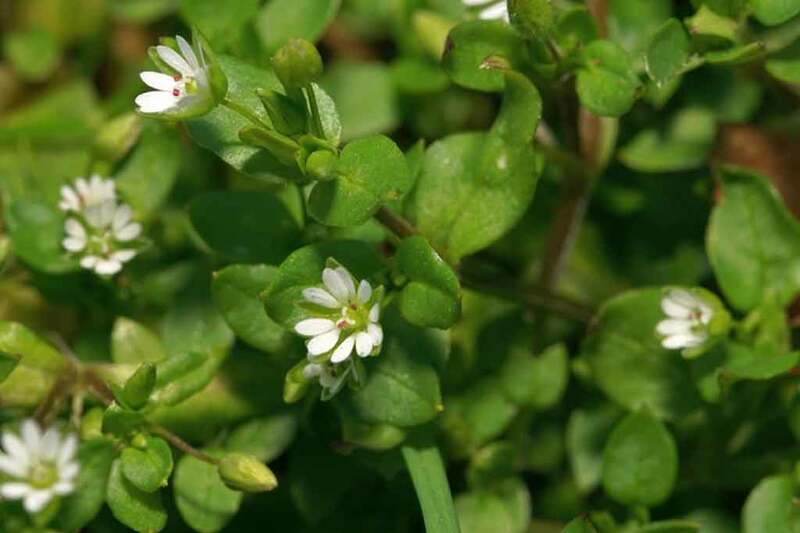 Common chickweed, a winter annual, is a low-growing, succulent weed that often spreads out in extensive mats. It may survive the summer months in shady, cool areas that offer sufficient moisture. 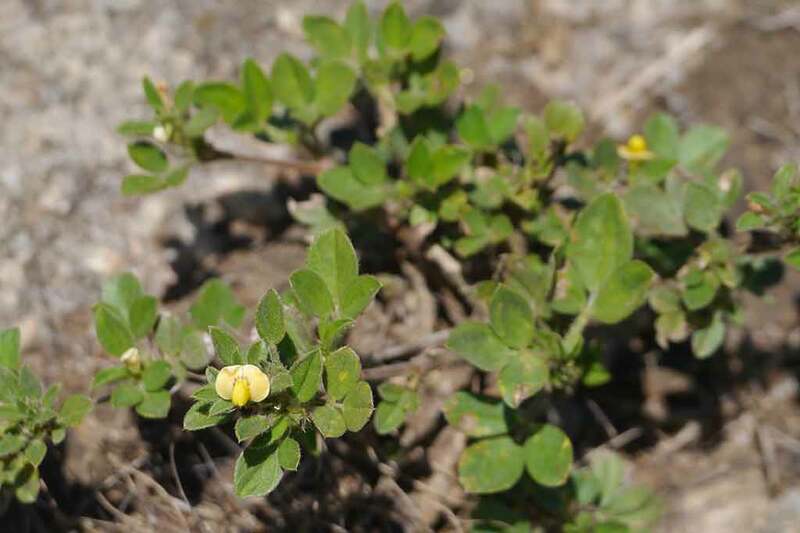 Along the California coast, it can survive year-round. Seed leaves have prominent midveins and are about four times as long as broad, tapering to a point at the tip. True leaves are broader, opposite, and yellow green. Chickweed mats may cover a large area. Stems are trailing, weak, and slender, with a line of hairs down the side. Mature leaves are ovate and opposite on the stem. Most leaves are attached to the stem by hairy petioles, but some upper leaves lack petioles. 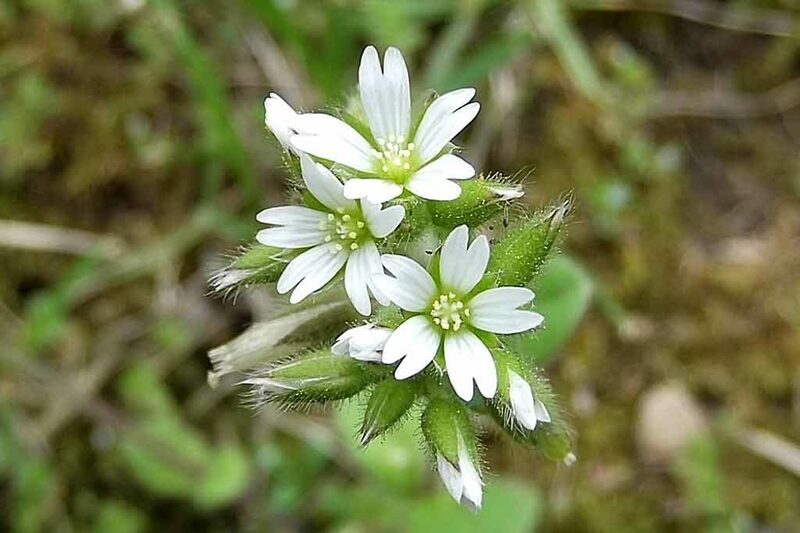 Flowers are small but showy with five deeply cut white petals.